HADOPI, French “three strikes” law rejected! 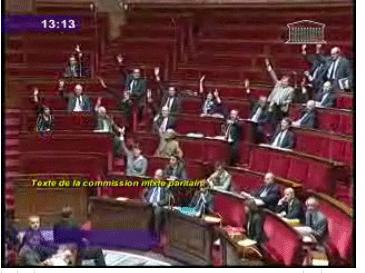 Paris, April 9, 2009 – In a surprising turn of events, the national assembly has rejected the HADOPI bill creating the “three strikes” scheme in France, in the final discussion, by a vote of 15 in favour and 21 opposed. The voice of the people and the innumerable criticisms1http://www.laquadrature.net/wiki/Contre_hadopi raised against the nonsensical, dangerous bill ended in being heard. This law planned to give the entertainment industries the power to police the Internet by themselves, as well as creating an administrative body that would sanction internet users with no opposable or verifiable proofs. By an unexpected majority including members from all parties, the vote by a show of hands rejected the bill definitively, against all expectations. “This is a formidable victory for all citizens. This vote shows that it is still possible to make oneself heard. It is a fantastic example of how to use the Net to fight against those who are trying to control it. Individual liberties, in the end, have not been sacrificed to try to preserve the corporate interests of some obsolete industries. The HADOPI law has been interred earlier than expected” states Jérémie Zimmermann, co-founder and spokesperson of La Quadrature du Net. Nonetheless, La Quadrature du Net asks its supporters to remain vigilant. The rejection of HADOPI doesn’t mean the end of the government’s attempts to control the Internet2Watch out our action around the ”Telecoms Package” directive about to be voted by European Parliament for its 2nd reading: http://www.laquadrature.net/Telecoms_Package.. We must continue to make use of our collective intelligence and the power of the net to preserve justice and the truth. 2. ↑ Watch out our action around the ”Telecoms Package” directive about to be voted by European Parliament for its 2nd reading: http://www.laquadrature.net/Telecoms_Package.